When I realized that Bronfebrenner (1979) had constructed an ecological model of the concepts of: microsystem, mesosystem, exosystem, and macrosystem, I typed it into “images” on google right away. I found a lot of the same models that have been used in the last two excellent blog reports. But what other images could demonstrate the ecological model, and/or exosystems. Top 5 Exosystem/Ecological Model responses. 5. Socio-Economic status and background also factors into one’s exosystem. Someone's exosystem is affected by their socioeconomic status. 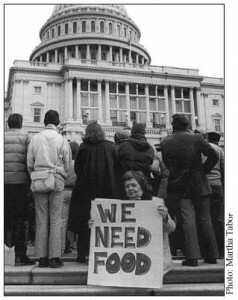 Pictured is some individuals that are in poverty. 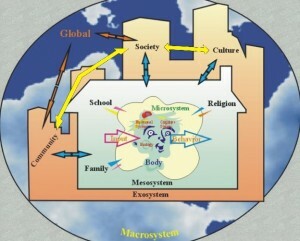 The exosystem follows the microsystem, mesosystem, and the macrosystem, and comprises the community-society-culture system. The implications that the exosystem has in an individual’s and family’s life is significant. I’m not sure how to explain this unless I make it personal. 1. They lived in a middle class neighborhood (based on socioeconomic status). This then also determined which school in which he would be enrolled. Tommy went to the Midway Independent School District, which had other middle class neighborhood children/teenagers. 2. The Johnson family went to the Robinson Church of Christ where they were a part of a conservative community. 3. Steve, Tommy’s dad, worked for the State Comptroller’s Office. 4. Brenda, Tommy’s mom, worked at Lorena Elementary School. 5. Brenda has an informal support groups of other teachers and moms that she can call upon. 6. Steve was an Elder at the Robinson Church and continues to have ties to this social network. 7. Tommy was in Choir, Theatre, and the Youth Group. He had many outside school activities with these groups. 8. Tommy had a Face-book in which he could enjoy “social networking”. All of these items mentioned were examples of exosystems in my Family of Origin, when I was growing up. Bretherton (1993) concludes that exosystems or second-order networks, “are most influential when important values in the second order setting (e.g., local government, the parental work place) impact on values in the primary setting (e.g. the family). The individual creates their own differentiated exosystem that they bring back to the family to then ( in a beneficial way) combine to form the family exosystem. The Exosystem therefore is very important not only in the family, but even more so in the ecological makeup of the world. The exosystem is not “just another thing” one may conclude. However, exosystems that we have seen can truly shape how our exterior self is perceived. These exosystems that our families, individuals are involved with also determine how our systems continue to navigate toward societal, cultural, and community changes and growth. In the researches that I studied, few if any mentioned “social-networking” such as Twitter, Myspace, or Facebook. All of which are exosystems that invariably affect family systems in positive and negative ways. Few studies mentioned other forms of media. What role does the media play in the exosystem? I have shown a clip from “Full House” and “Mr. Rogers” which were both popular television shows from my “exosystem” growing up. But, this is probably not the case for every individual that grew up Hewitt, TX. The media that allowed into the house is and probably forever will be a powerful context in which family’s have to agree upon in the building of their exosystem. Exosystems seemingly are not the core of the individual and the family system, but it does seem like the exosystem is how the individual and/or family system shows who they are to the outside world. 1. What exosystems are/were huge in your life that hasn’t been covered? What implications did they have/do they have in your family system? 2. What T.V. show did your family as the mesosystem externalize and agree on as the exosystem? In other words, what show did your whole family agree on and how did y’all decide upon it? 3. Do you agree that the exosystem is the externalization of the interal processes that make up a family system? Why or Why not? Bretherton, I. (1993). Theoretical contributions from developmental psychology. In P. G. Boss, W. J Doherty, R. LaRossa, W. R. Schumm, & S. K. Steinmetz (Eds. ), Sourcebook of Family Theories and Methods: A Contextual Approach (pp. 275-301). New York: Plenum Press. Cicchetti, D., & Valentino, K. (2005). An ecological-transactional perspective on child maltreatment: Failure of the average expectable environment and its influence on child development. In D. Cicchetti & D. J. Cohen (eds. ), Developmental Psychopathology, 2nd ed. (pp. 130-184). Hoboken, NJ: John Wiley & Sons. I definitely think you covered many of the exosystems a person could potentially be a part of. One that was in my life, along with the church, school, and the work atmospheres for my parents, was y different sports teams. Each one had a different dynamic with different personalities making up the whole of the group. It intereesting to think backk on those teams now in this light. But seriously, I feel like experiences from both of those groups became part of who I am today, and perhaps I wouldn’t be who I am today without them. 2. Fascinating question! My family had two favorite shows. #1 The Simpsons. My Mom hated this, and would die of embarrassment if she knew I were sharing it with you guys, but I think it highlights my family’s need to laugh at life and the frequent absurdity of it. Also, it underlies a sad theme in my family of women being smart/competent and men being kind of a joke. The other show was Home Improvement. Like so many other shows it taught us that realitively happy middle-class American families are the norm, and helped us to feel go about the life path we were on. 3. Man you know, I think it is a reciprocal relationship. I feel like this is a “which came first” question. I think it is probably more important for us to think about the way the exosystem does represent our internal processes in good and bad ways. So often we view these large social structures as something separate from us, when in so many ways, we constantly created each other, and thus, the set up of the school system has much to say about the values of individuals of this nation. 1) My family was highly impacted by several different exosystems such as; our church, sports groups were were involved with, and co-workers of my parents. All of these had a huge impact on my family in a variety of ways. They helped us come together and grow in our faith, recreational activities, and times spent together in a social setting. 2) My family didn’t do a whole lot of watching t.v. together but the few times I can remember doing it was spent on Full House and Growing Pains. Full House had a big impact on us because my parents were single and trying to raise three kids with the help of various family members. I think that watching Danny Tanner trying to help his kids handle the pressures of growing up and all of the situations that surround it, helped my dad with my siblings and I. 3) I don’t know if exosystems necessarily make up a family’s internal system but I definetely think that they play a part in them. I know that I have been extremely influenced by different groups I have been a part of and don’t know if I would be the same person that I am today had I not endured the same experiences. I love your examples, Tommy! Interestingly enough, the only family-based sitcom my family ever watched was The Cosby Show. I say that’s interesting because I consider my family to be covertly racist (I feel a bit disloyal saying that). I think the reason my parents liked that show was because it confirmed their belief that everyone, regardless of their race/ethnicity or social context, has the means to become a doctor/lawyer and to live an upper-middle class lifestyle if they just put their mind to it. The Cosby Show was great in that it showed an African American family who didn’t fit the stereotype of the time. But I wonder how much, if any, it contributed to maintaining institutional racism in our culture? Dr. Goff, I believe that my family was covertly racist too! I think we also watched shows like Promised Land, 7th Heaven, and Touched by an Angel to show that if you only had more faith–God will bless any family! Yikes! I do not believe this now, however. Well, I guess I would have to change it to believe what I think is underlying in the statement. Like, I believe that families who have faith in God are fulfilled in a different way than if they are not… There was a lot of religious anxiety in my family, which caused those shows to add to our Exosystem. Je pense vraiment que vous couvert un grand nombre de exosystems une personne pourrait être une partie de. Celui qui était dans ma vie, avec l’église, l’école et les atmosphères de travail pour mes parents, c’était y différentes équipes sportives. Chacun avait une dynamique différente avec différentes personnalités qui composent l’ensemble du groupe. Il intereesting penser backk sur les équipes maintenant dans cette lumière.